Having set precedence three years ago, and continuing annually since, Her Majesty's Consul General for the Southeastern USA, Hon. 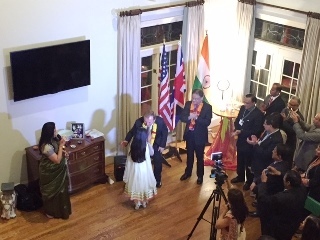 Jeremy Pilmore-Bedford of Great Britain, hosted about a hundred guests to celebrate the global Indian festival of Diwali at the British Residence, Atlanta, on Friday, November 13, 2015. This was during the same week that India’s Prime Minister Shri Narendra Modi was visiting with British Prime Minister, David Cameron. A large rangoli decorated the concrete entrance in front of the house, and tea light candles lit the driveway, the step leading to the front door, and all through to the house as well as all along the inside of the main hall on the first floor. 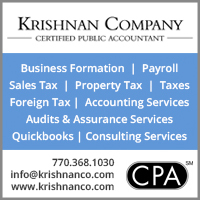 Each guest was presented with a bite size ladoo (Indian holiday sweet) upon entering the home, then signed the welcome register with their remarks and contact information before picking up their Diwali event nametags. The Indian, British, and American flags were admirably displayed on stands while guests enjoyed social networking and predinner drinks. Present were Hon. Consul General Nagesh Singh and Mrs. Pragya Singh of the Republic of India. As the program began, Nishtha Mayani graced Consul Generals Singh and Pilmore-Bedford with a traditional Indian floral garland. 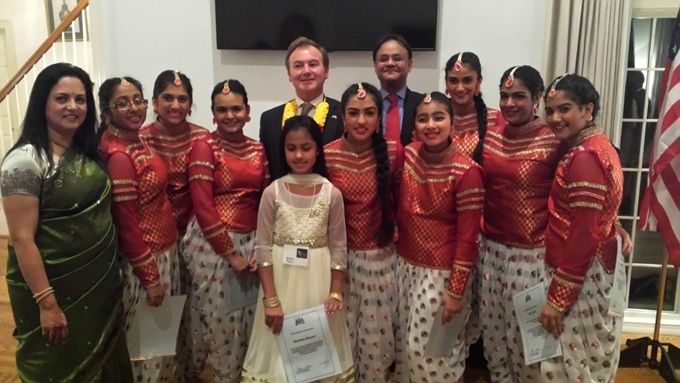 CG Jeremy Pilmore-Bedford spoke of his excitement in hosting this annual event at a time when the leaders of both India and the United Kingdom were meeting in London. He announced some of the significant contributions that British Indians were making in the UK, as well as of the Indian-Americans who had ties to the UK and engaged with the British economy. CG Nagesh Singh said that he was completely floored by the affection and admired the way that CG Pilmore-Bedford hosts this annual event. He declared he should have hosted one himself, but he was out traveling for the past month and half, so he was delighted that his “colonial cousin” was hosting one with equal prominence. He stated that the diaspora greatly appreciated the friendly gesture and surely this celebration has led other governmental organizations in the US to follow suit. He also shared highlights of the contributions made by Indians in England and how the United Kingdom continues to be a focus for trade and economic development by the Indian Government, as formerly stated by Prime Minister Modi. 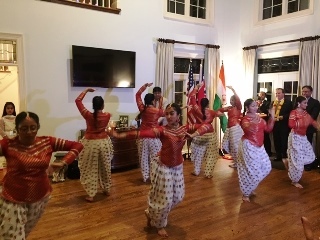 The formal remarks were followed by a spellbinding fusion dance performance choreographed by Rifka Mayani of Tandav Themes and performed by the dancers of the Jain Society of Greater Atlanta (JSGA). 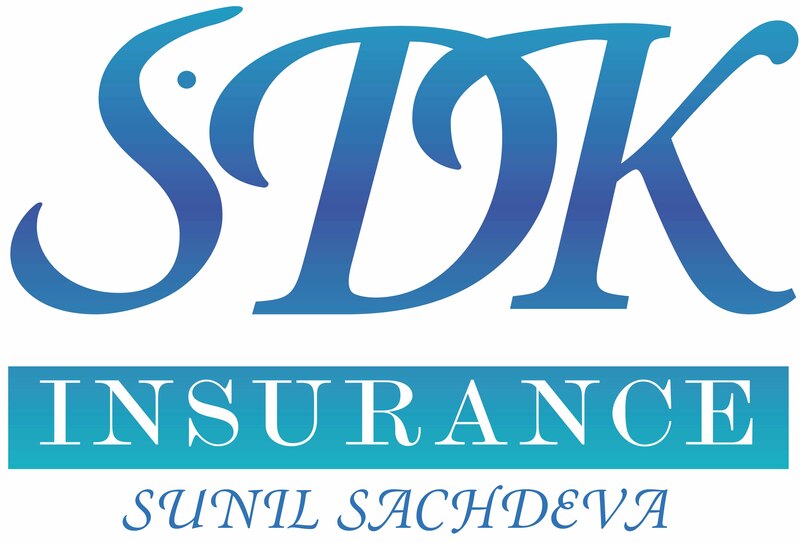 They danced to the Academy and Grammy Award-winning number “Jai Ho” created by music prodigy A. R. Rahman for the British producer-director Danny Boyle’s Oscar-winning Slumdog Millionaire. 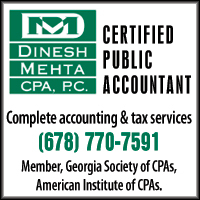 The JSGA performers were Rehna Sheth, Maya Shah, Anusha Jain, Simran Modi, Pari Jain, Ridhi Ajmera, Mehak Jain, and Hansinee Mayani. The group received tumultuous applause as cameras flashed and videos rolled. 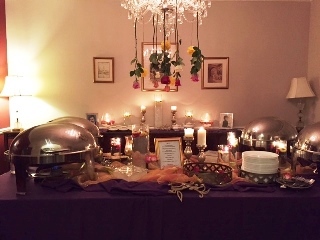 It was an intimate affair with warm hospitality and a great atmosphere, culminating in a delicious dinner of catered Indian food. All left looking forward to next year’s event. Rifka Mayani of Tandav Themes stands with the dancers of the Jain Society of Greater Atlanta (JSGA), Rehna Sheth, Maya Shah, Anusha Jain, Simran Modi, Pari Jain, Ridhi Ajmera, Mehak Jain, and Hansinee Mayani, who performed for Consul Generals Jeremy Pilmore-Bedford and Nagesh Singh and guests at the British Residence, Atlanta, on November 13, 2015 for the British Consul's Divali celebration.